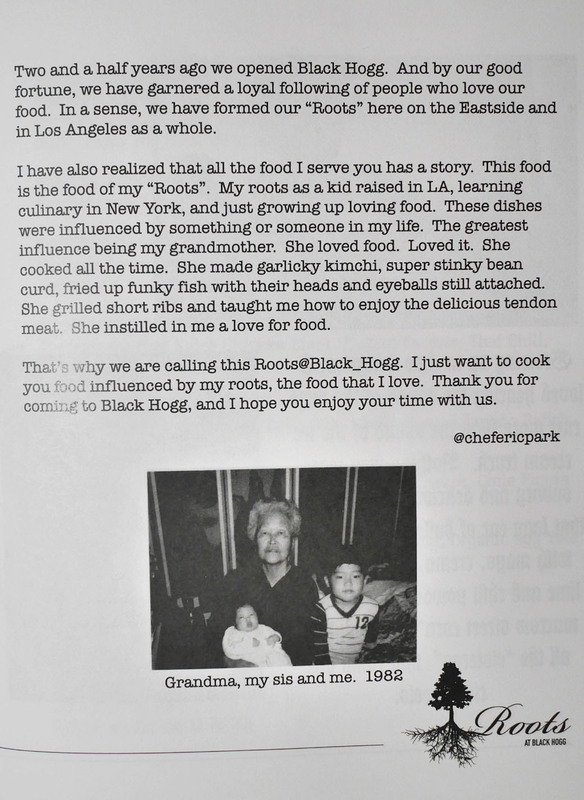 Since debuting in 2012, Eric Park's Black Hogg has firmly established itself as one of the darlings of the Silverlake dining scene. 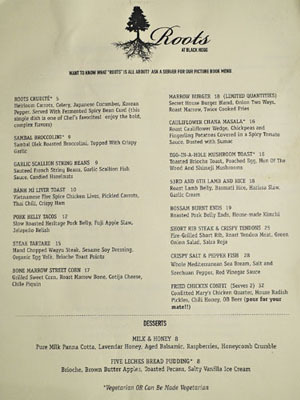 However, the Chef apparently wasn't content with just that, and at the end of July, shut down the restaurant for a couple of weeks to retool. 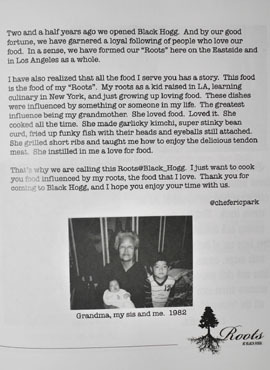 The result was Roots at Black Hogg, a slightly rejiggered concept that featured a menu inspired by Park's culinary upbringing, with a particular emphasis on his Korean roots. 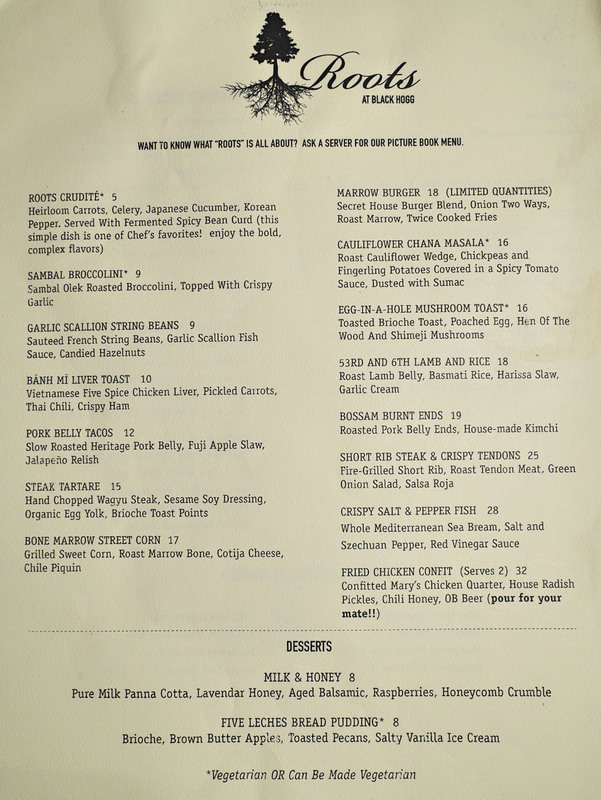 Roots' menu reads like a grittier, more multicultural version of the original, with some of the old standbys joined by a number of new dishes. 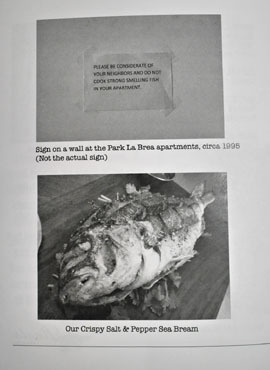 For a more thorough exploration of the Chef's thought process, you can even request a picture book menu to peruse as well. Click for larger versions. 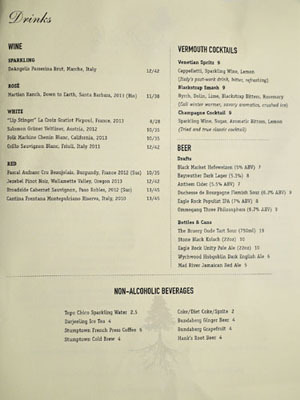 Said menu offers a closer look at the roots behind Roots. Click for larger versions. 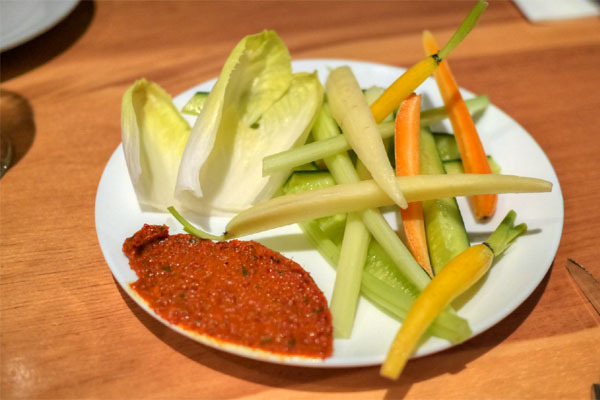 Things got off to a refreshing start with the Chef's Korean-inflected take on crudités, which played the crisp, vibrant veggies against the earthy heat of ssamjang. Satisfying in its simplicity. Beer's always a good pairing to Park's food, so we brought along several bottles to enjoy with the eats. 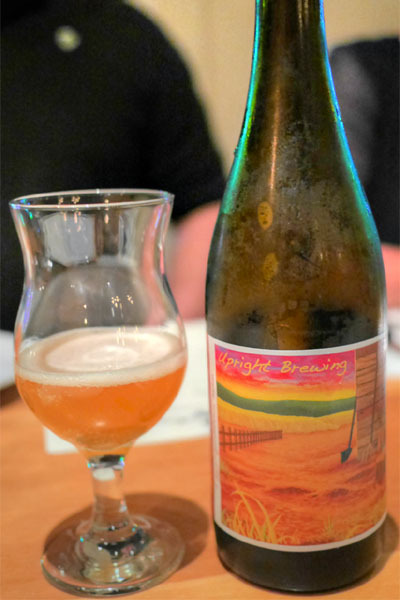 First up was the limited-edition 2014 Upright Barrel Aged Flora Rustica, a saison brewed with yarrow, calendula, and hops, then aged for a year in Lactobacillus-infected casks. There was definitely more going on here than in your typical farmhouse ale. The bouquet veered funky and citric, with a distinct mustiness to it. This continued on to the palate, where it was joined by dry, bitter, herbaceous notes, the whole thing finishing long with a lingering taste of botanicals. One of my dining companions recently scored a large cache of Bell's beers from Michigan, so we brought along a sextet to sample. 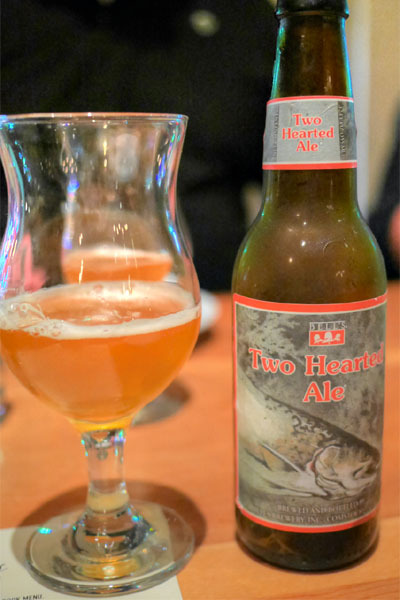 We got started with one of their most well known brews, the 2014 Bell's Two Hearted Ale, an outstanding example of the IPA style: wonderfully floral and complex on the nose, while taste-wise, you got a great balance of hop bitterness and sweet malt backbone. Smooth and delicious. 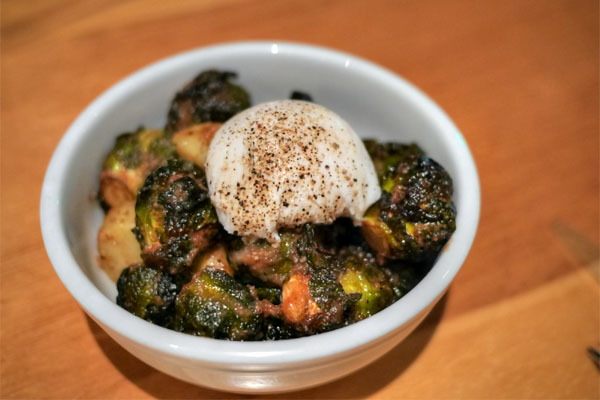 I can't say no to Brussels, so we just had to try the lone special of the night: a delectable combo of bitterness and char, set off by an underlying layer of sweet 'n' sour tang while the potato added a delightful heft and potency to the dish. Can't deny the appeal of that runny egg, either. Yum. 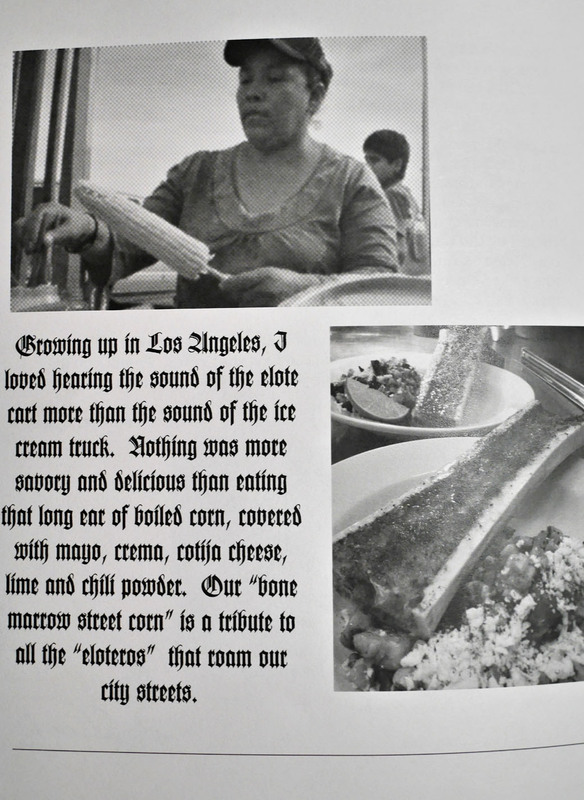 Here, Park paid homage to the eloteros of his childhood and their delicious street corn. Slick, slippery marrow was super rich, almost conveying a foie gras-esque lushness to it, and once mixed in with everything, made for a tasty treat indeed. The sweetness and texture of the corn served as a great counterpoint, and the heat from the pequin provided a flawless finishing touch. I'd never had marrow like this before. 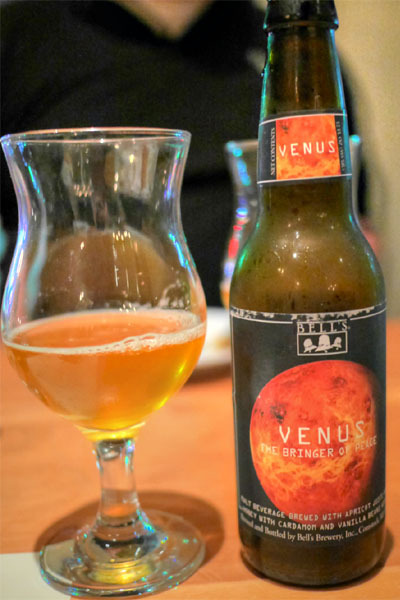 The 2014 Bell's Venus was part of the brewery's Planet Series honoring the music of composer Gustav Holst, the second release from the line-up. A blonde brewed with honey, apricot juice, vanilla bean, and cardamom, it was quite unlike anything else I'd had before. Think loads of honey on the nose, and a palate that was teeming with sweet, floral vanilla nuances--very neat. The oft-hyped 2014 Alpine Exponential Hoppiness, on the other hand, was pretty much the polar opposite of the Venus. An exponentially-hopped triple IPA, this one was super pine-y in terms of aroma (perhaps too much so for me), though in terms of taste, the hoppiness of beer was superbly balanced by a combo of malt and tropical grapefruit flavors. Quite smooth and easy-drinking despite its strength. Here, the Chef paid tribute to the hero of the traditional bánh mì, the pâté. 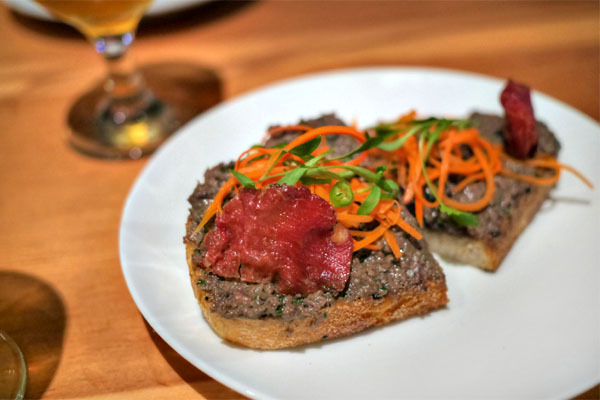 And indeed, the liver was the star of the show, displaying all the deep, earthy flavors that you'd want, offset by the crunchy carrots while Thai chile imparted a sharp underpinning of heat to the dish. 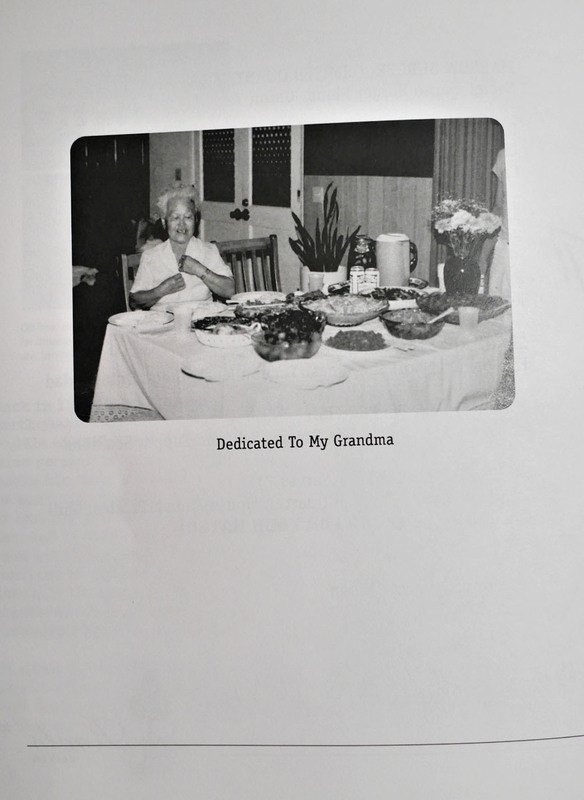 I would've liked to have seen more pickles though. 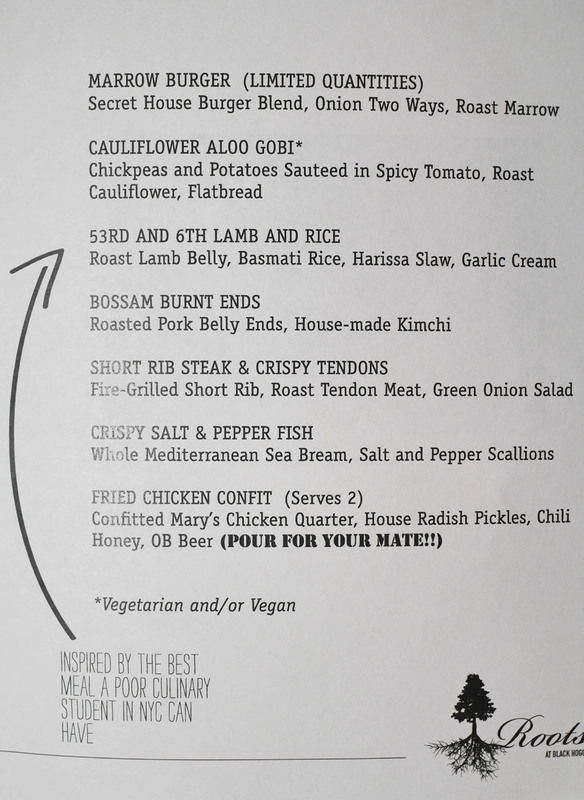 In our next course, Park gives a nod to NYC's famed Halal Guys, a staple food for the Chef from his time spent in New York. I'd actually had a version of the dish on my last visit here, and though I found that iteration rather tasty, this one was even better, coming out more completely formed than before. 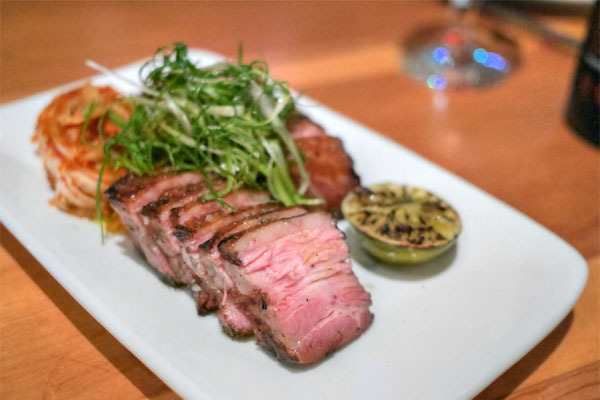 The lamb itself was a force to be reckoned with, a super fatty, super charred, super "lamby" prep that was beautifully balanced by the zesty slaw. I loved the base of firm basmati rice here as well, and the undercurrent of spice permeating the course was much appreciated, too. 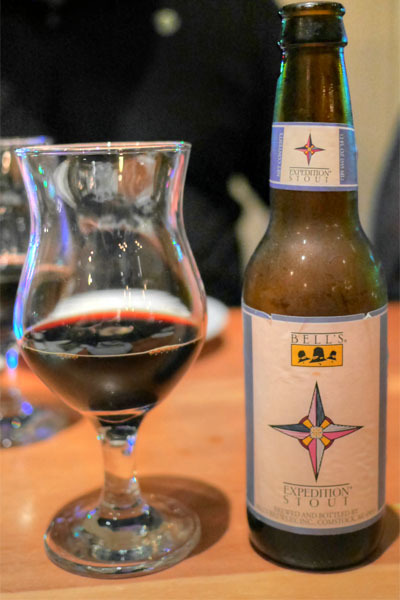 Continuing on with the Bell's barrage, here we had the 2014 Bell's Expedition Stout, one of their most well-known offerings. It was an intriguing take on a stout. It had your malty, roasty flavors that you'd expect, but there was this savory-slash-bittersweetness that I couldn't quite put my finger on as well. 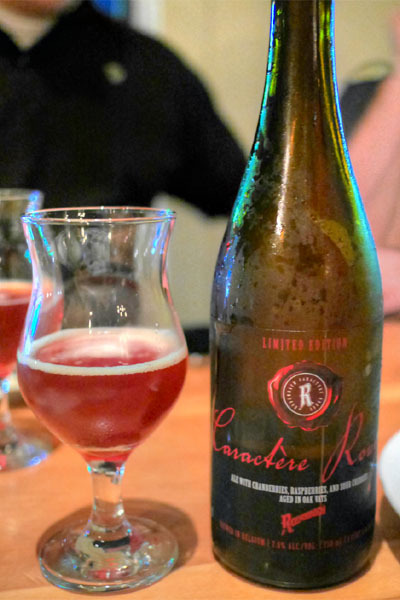 Our lone sour of the evening was the 2014 Rodenbach Caractère Rouge, a Flanders Red aged in oak for two years, then macerated with cranberries, raspberries, and sour cherries for six months and re-fermented in the bottle. It was a tasty one, with your classically tart, dry, oaky, vinous Rodenbach character balanced by a tinge of sugariness from the three types of fruit. 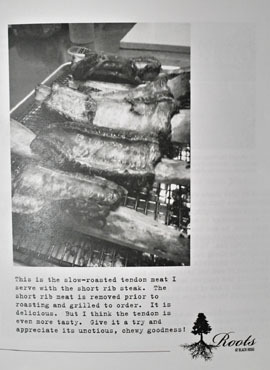 Park's take on eggs in the basket was almost like an improved version of his earlier "Wild Mushrooms on a Brioche Box". 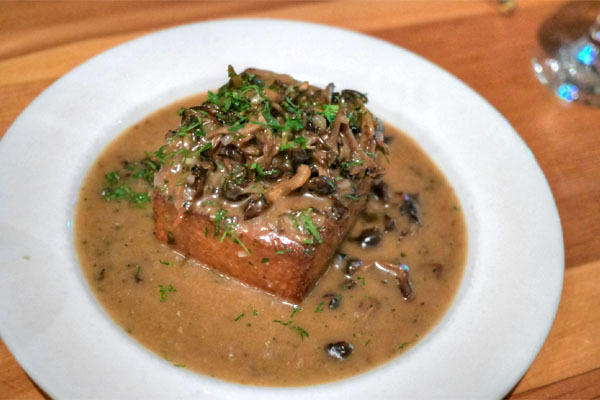 I appreciated how the mushrooms shined here, giving up their rich, savory, almost stroganoff-esque flavor against a backdrop of brioche while the runny egg helped tie it all together. 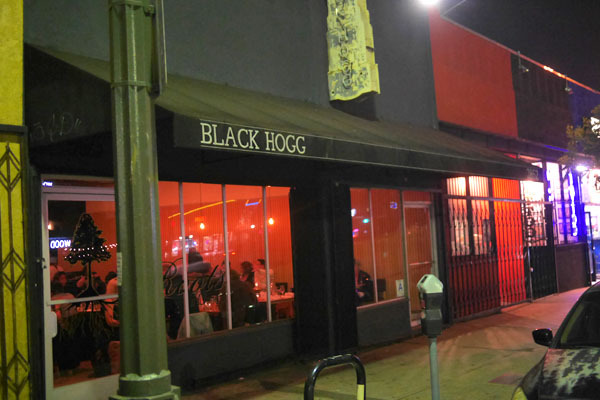 Black Hogg's bossam might be the only version of the anju staple that has a legitimate shot of being better than Kobawoo's. The belly was as tender as I'd ever had it, a real celebration of porky goodness that displayed a winning combination of lean, fat, and char. The meat was certainly delicious alone, but taken with the homemade kimchi and herbs up top, everything just came together perfectly. My favorite dish of the night. 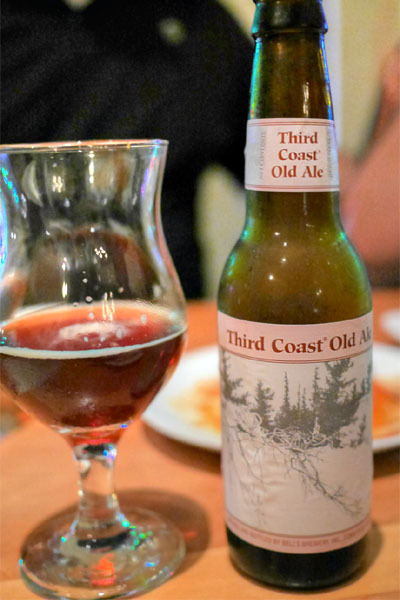 The 2014 Bell's Third Coast Old Ale was an American barleywine that I found surprisingly effervescent. It was probably my least favorite of the Bell's beers though, as its maltiness tended toward one-note. I think this one needed more age. 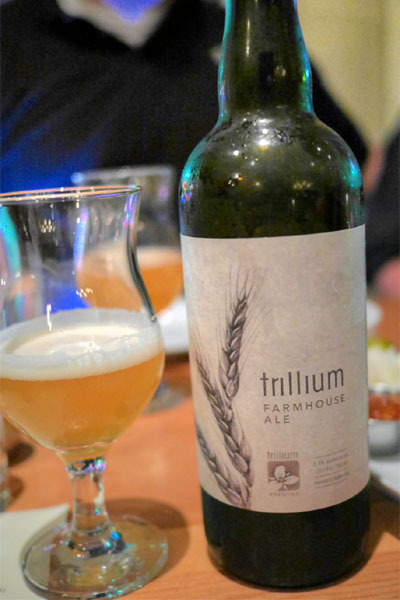 The 2014 Trillium Farmhouse Ale from Boston, meanwhile, was a bit more interesting, a dry, grainy, grassy, spicy brew with a lingering floral character. 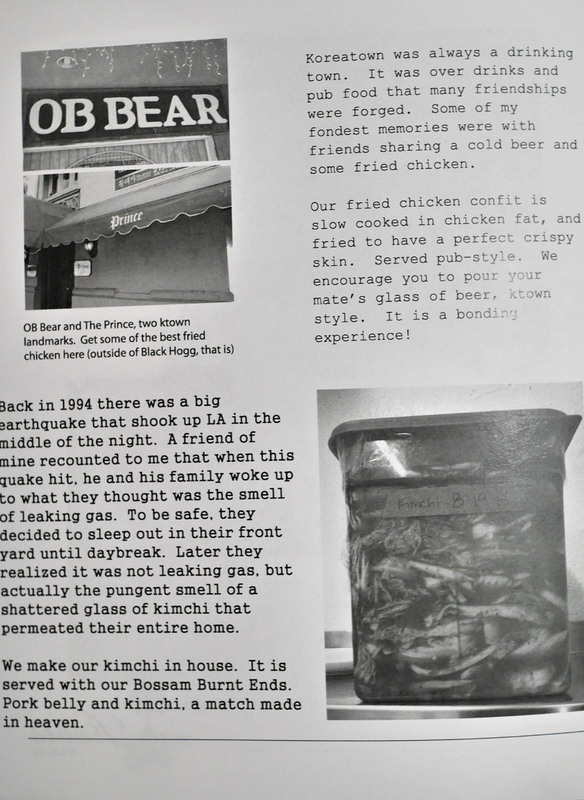 Another standout was the tong dak, Park's interpretation of the bar classic served at the likes of OB Bear and its ilk. 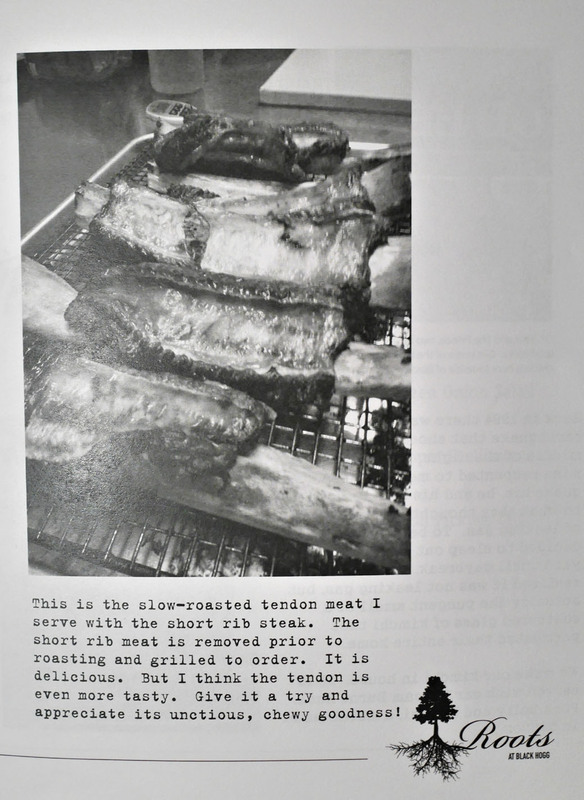 The dish comprised two thighs-n-legs, slow cooked in chicken fat and fried. 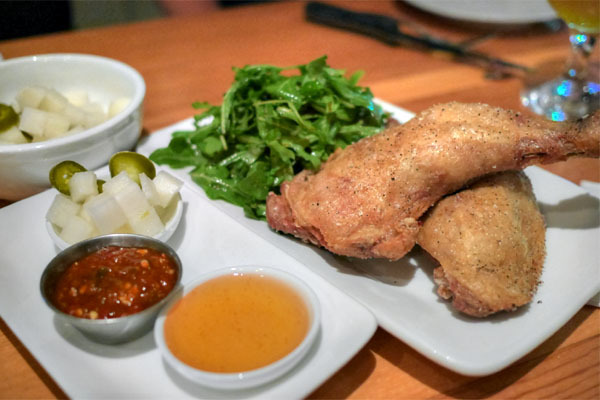 It was the most flavorful chicken I'd had in a long while, the tender, succulent bird really conveying a great mélange of salt and pepper flavors, all underscored by a slight heat. I appreciated the crunchy, tangy cubes of mu on the side as well, and the accompanying chili honey worked surprisingly well to boot. 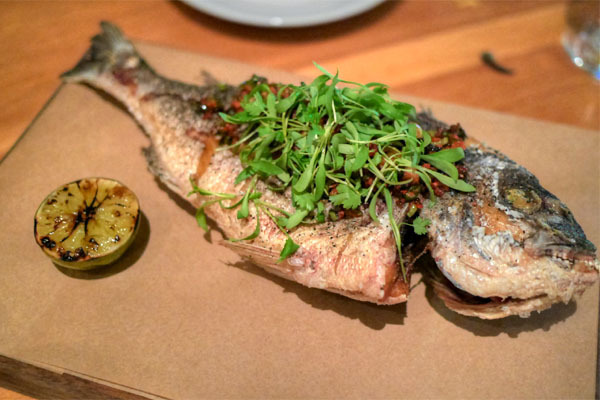 The kitchen then sent out an impressive presentation of deep-fried sea bream with chimichurri fish sauce, a dish ostensibly inspired by the Chef's grandmother. 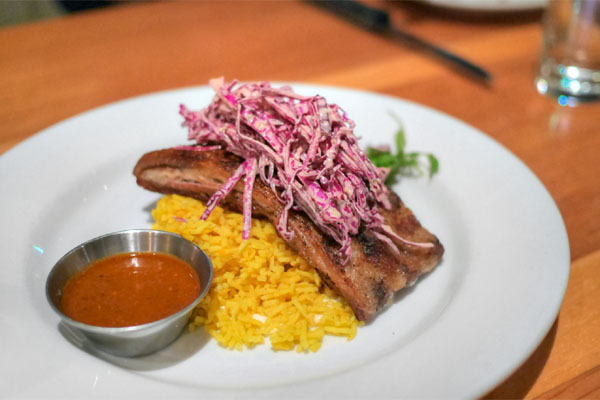 The fish was another highlight, arriving wonderfully crisp, juicy, and flavorful, with a superb S&P flair to go along with the potency of the chimichurri. 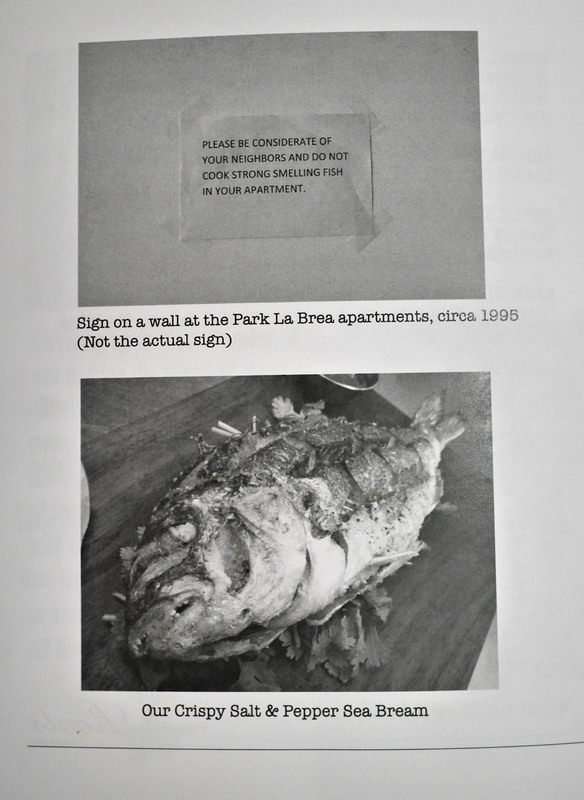 The best "whole fried fish" dish I've had in recent times. 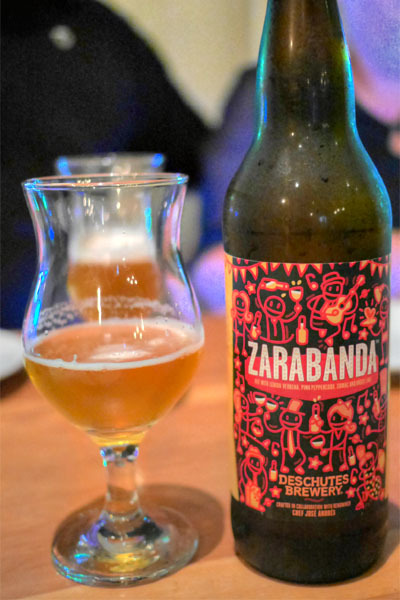 Our next round of beers brought the 2014 Deschutes Zarabanda, a Spanish-inflected saison produced in collaboration with culinary icon José Andrés. Brewed with lemon verbena, pink peppercorn, sumac, and dried lime, the beer was a refreshing tipple, with apple and stonefruit notes backed by a noticeable spice and bitterness--I could see this as being quite food-friendly. 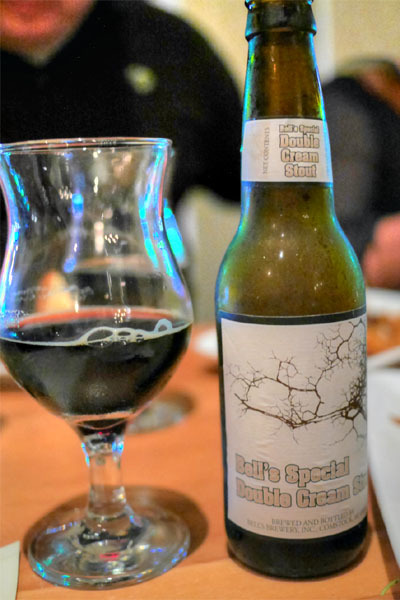 And for something completely different, the 2014 Bell's Special Double Cream Stout was as smooth and creamy as its name would lead you to believe. It was also appropriately malty, with a bit of roastiness and a pleasant commingling of soft chocolate and coffee-like flavors. Our penultimate savory was Park's rendition of the Punjabi-Indian staple chana masala. 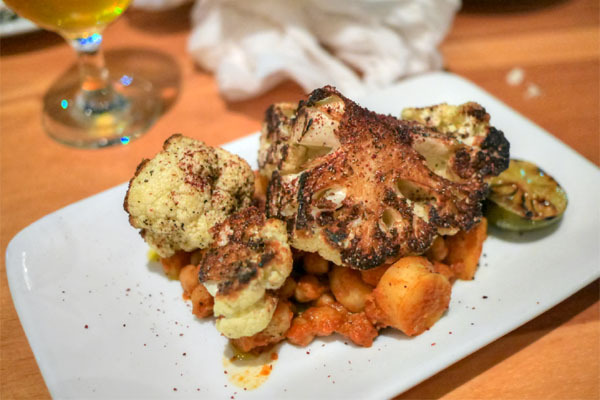 It stayed true to the essence of the original, with the spicy, tangy flavors in the dish proudly displayed, set against the comparatively mild cauliflower. 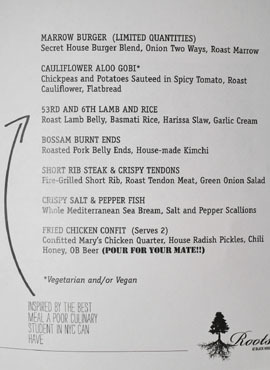 I quite liked the incorporation of potato here as well, which added a palpable bit of heft to things. 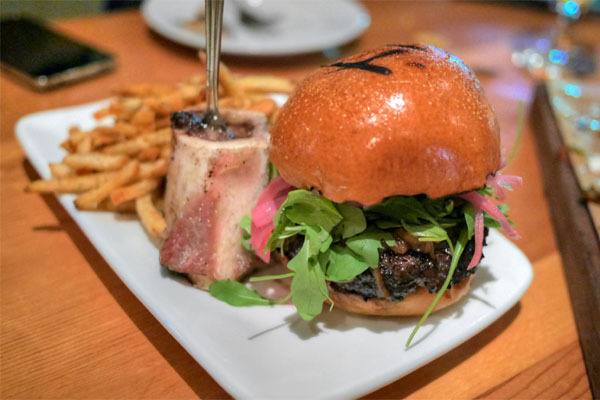 Last up was Black Hogg's signature burger. 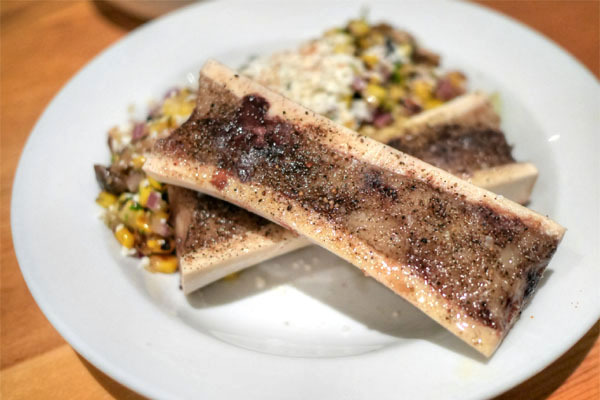 It was super flavorful, with the marrow adding a rather profound earthiness to the mix. 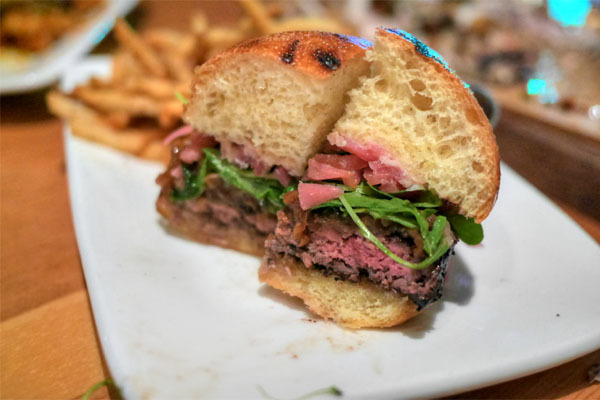 The contrast of the caramelized and pickled onions was much enjoyed as well, and the arugula finished nicely with its zestiness. The fries? Spot on. Our last set of beers definitely went more toward the dessert-y side. 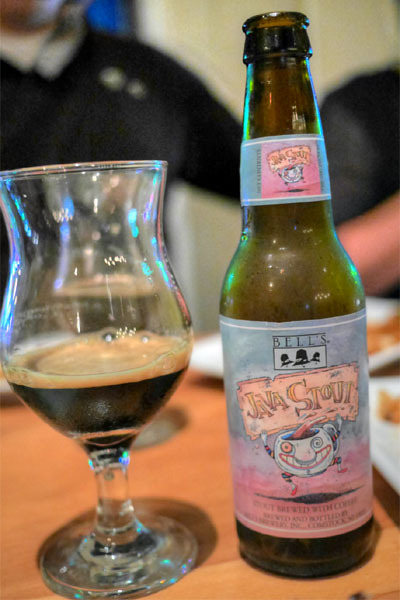 The 2014 Bell's Java Stout was one of the more coffee-forward beers I've had, with a nose that was not unlike smelling fresh beans. That sensation held true for the taste as well, which was roasty and smoky and teeming with coffee notes over a base of classic chocolate-y stout. We ended, fittingly, with the biggest beer of the night and one of the most robust I've tasted, period. 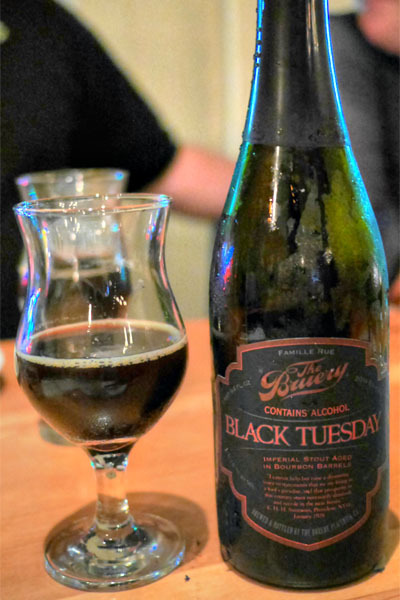 The 2014 The Bruery Black Tuesday had just been released weeks prior, and though I'd had the beer before, I'd never had it before this fresh. An imperial stout aged in bourbon barrels, it was quite unlike most other stouts I've sampled. The bouquet was super intense, massively redolent of dark fruit, while on the tongue, you got much more of the same, intermingled with notes of molasses, chocolate, oak, and bourbon, the beer finishing with a tinge of heat from its 19.7% ABV and a lingering sensation of chocolate-dipped raisins. 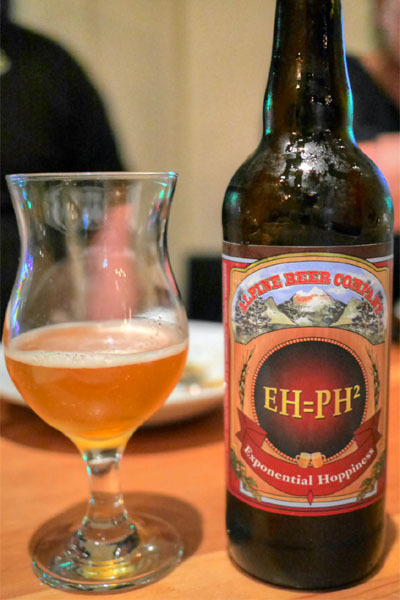 It was almost liqueur-like in intensity, and reminiscent of one of The Bruery's barrel-aged, solera-method old ales at times. 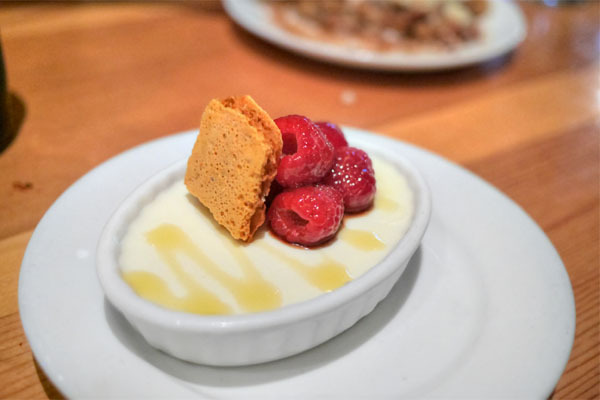 Panna cotta came out lactic and tangy in our first dessert, with a nice hit of acid from the balsamic and berries while the honeycomb added a smoky touch to the dish. 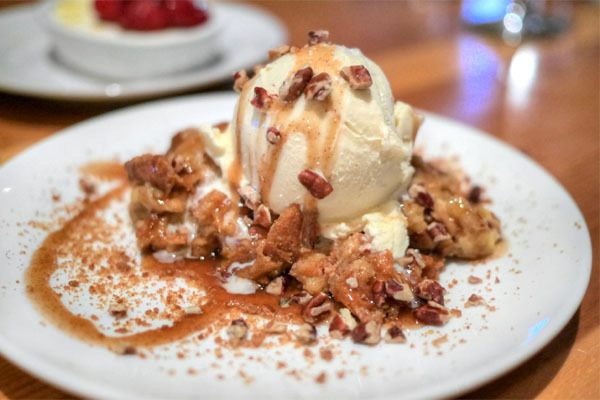 The bread pudding was more intriguing, a satisfying mish-mash of dark fruit, caramel, and cinnamon-y flavors set off by a delightful scoop of ice cream. 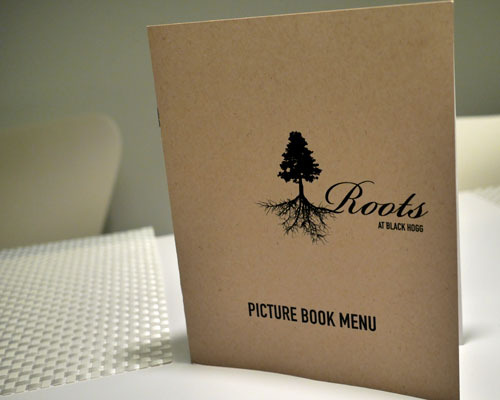 Roots started out as a summer pop-up sort of thing, but word is that it might run indefinitely. I can see why, as the food is better than ever, combining the flavor-forward cooking that Park's been known for with some more "ethnic" stylings. It's a winning combination that all of us tonight enjoyed. 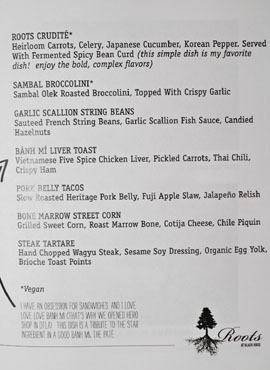 In fact, I'd love to see the Chef explore more of his Korean background, to put out his own versions of staples such as jeon, dubu kimchi, or best yet, soondae. Hey Kevin. It's your old time follower Vahe. 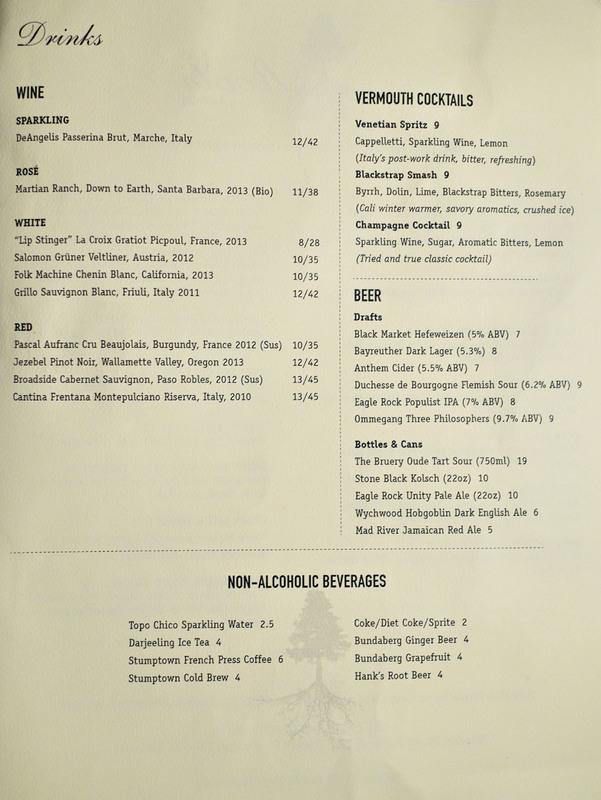 I go to Black Hogg all the time and hold Cantillon tastings there. 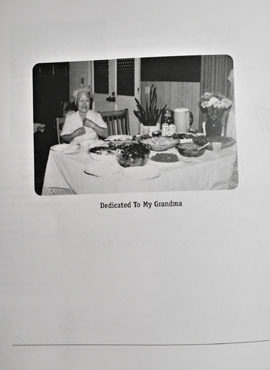 I should let you know about next time. Chef Park loves beer, we always send half the bottle into the kitchen for him to enjoy. I should also get you involved with our beer tastings. I see you gathering better and better stuff each month. Awesome. 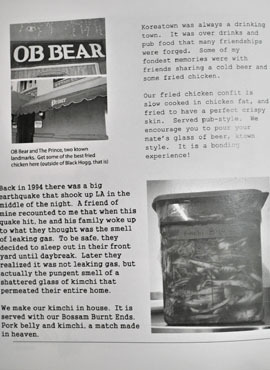 Kevin, I've been loving your beer parings, such a relief from the wine, but to see you at Black Hogg and with a Black Tuesday, I really LOVED reading this! Please keep up the super awesome work! LOVE IT!!! Vahe: Very nice with the Cantillons! We make sure to give the Chef a taste of everything as well. Michael: Thanks, it's been a lot of fun with all these beers, and the BT was definitely a standout, one of my best of 2014 for sure.